We were planning to pen a Skylanders eBay round-up to tie-in with today’s release of Swap Force, but aside a store display case and various variants selling for £100+ there isn’t much to report on. So with Pokemon fans currently trying to catch’em all in Pokemon X/Y, we’re instead going to look at various Pokemon goods that have shifted for significant sums. At a resounding £1,255, a first edition Skarmory Pokemon card signed by Ken Sugimori is the most expensive Pokemon item to have sold on eBay recently. A well as Suimori’s signature, it also contained a small doodle of Pikachu. We guess Skarmory isn’t quite as easy to draw. Pokemon cards remain incredibly popular with collectors – many full sets and individual rare cards can sell for eyebrow raising amounts. Sealed boxes of cards are surprisingly frequent on eBay too, and understandably sought after. A seller based in Greece has sold 3 boxes of sealed booster packs for £499 each. If only the Greek government had kept hold of a few boxes then maybe they wouldn’t be in quite the mess. 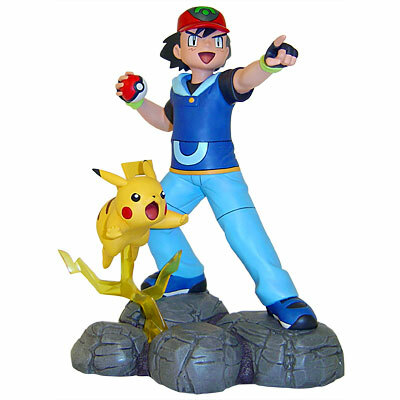 A couple of items released to celebrate Pokemon’s 10th anniversary in 2006 have proven popular lately also, including not one but two porcelain Ash and Pikachu statues. 1500 of these were made, available only to purchase in the Pokemon Centre store. A new and unopened statue ended at £615 while an opened statue – which the seller reports has been kept in a glass case – ended for a lot less at £111. 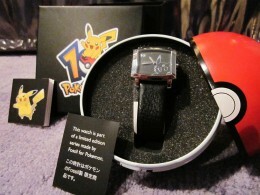 The 10th anniversary Fossil watches were likewise limited 1500 units, one of which sold for £130. The black and silver timepiece features a decal of Pikachu and comes packaged in a Pokeball-shaped case. The seller reports that it was purchased from the Pokemon Centre in New York before it closed back in 2005. Factory sealed games are always popular with collectors, and Pokemon games seemingly more so. An unopened copy of Pokemon Crystal for Game Boy Color sold for £560, while an original Pokemon Red went for £230. A copy of the Fire Red GBA re-release meanwhile ended at £190. How about a limited edition handheld to match? An unused Japanese 3DS LL Charizard limited collector’s edition ended at £399 while an auction for a UK Pikachu 3DS XL ended at £360. Even on Amazon these can sell for £380, despite being less than a year old. 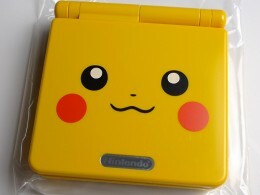 Then we’ve got a Pikachu GBA SP from 2005, which bears a pleasingly minimalistic design. It ended at £307. Contrary to popular belief, not all Pikachu edition consoles are bright yellow – this GBA Micro features an silver etching of Pikachu while the handheld itself is black and red. After 5 bids it sold for £205. Although fairly easy to find when first released, Pikachu N64 consoles can cost a fair bit now. A boxed model in very good condition sold for £132, while a rarer Japanese orange model actually sold for less – £131. Proving just how unpredictable eBay can be at times, an opened pack recently went for just £117. Lastly, here are two ‘not for resale’ DS cartridges intended for retailers. One allowed Pokemon Black/White owners to grab Victini, and sold for £300, while this other one let players collect Keldeo and sold for £100. Let’s just ignore the fact that Keldeo looks like a My Little Pony in disguise, shall we?